Continuing my endeavors of trying out new software, I recently tried the Demo Version of ImagesPlus. The interface is more clean than the MaximDL, but both software does the job well when stacking my Nikon 810A Raw files. I also have been playing with layering in Adobe Photoshop. I am using the older version of CS2 of Photoshop, but it is more than adequate for layering pictures. 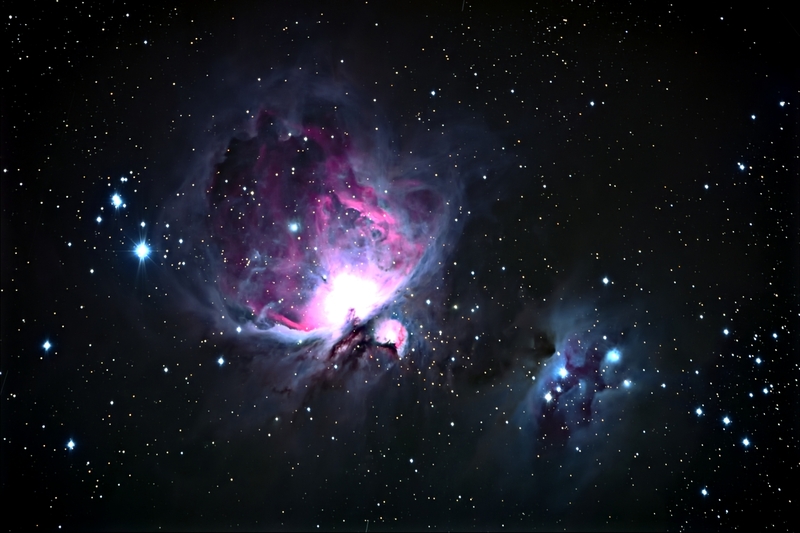 I chose as my subject for layering the Jewel of the winter sky, the Orion Nebula M 42. I took the picture using my HyperStar Lens on my 14 inch Celestron Scope and my D810A Camera. 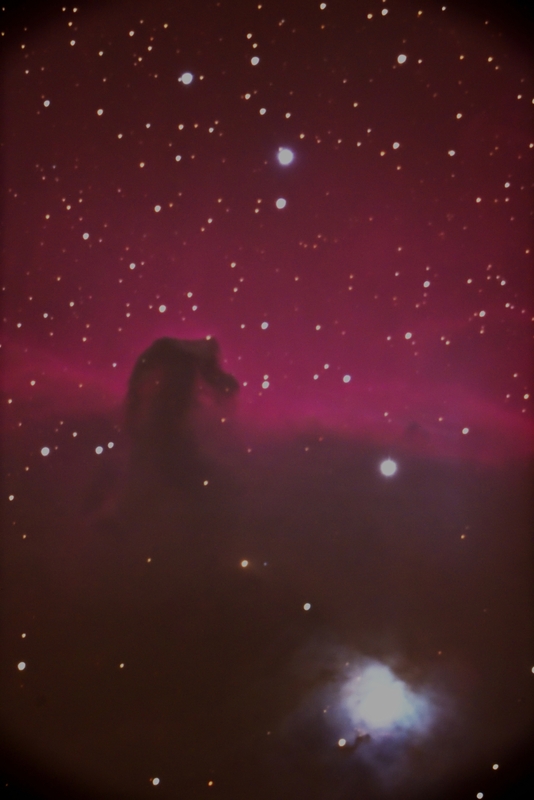 I took two different shots of the nebula for layering purposes. 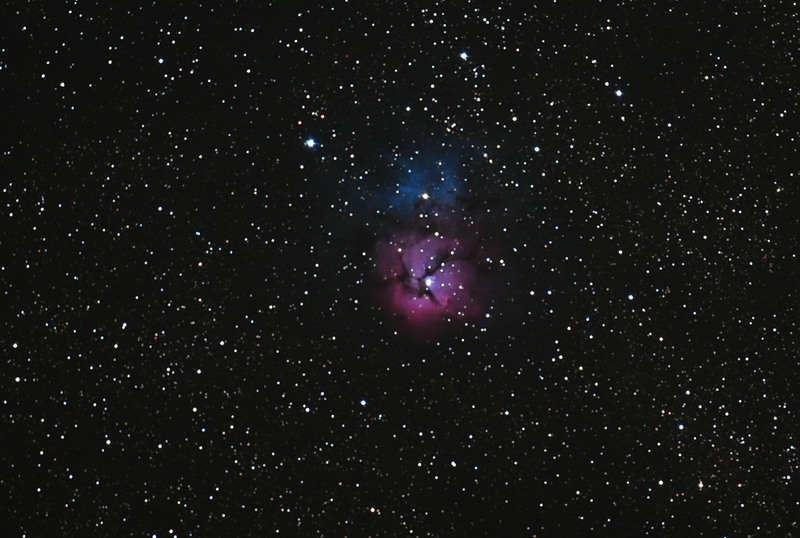 The first layer is a longer exposure in order to capture the entire nebula and gas clouds. The problem is when you do this you lose the center "Trapezium" of the nebula as it is too bright. The second layer photo was taken with much shorter exposure. I lose the gas and dust clouds, but I gain resolution of the center trapezium stars. I then overlaid or layered the two photos to get the final image. The Images are shown below. A larger picture of the layered version is shown in the Gallery. I have been trying out the Demo Version of Maxim DL so that I can stack my NEF images from my new D810A Nikon Camera. I have exclusively been using DeepSkyStacer, but the color was not rendering properly with that program. I stacked 5 images of the Fireworks galaxy and the color came through. Compare the image below with the image shown on the August 27 post on this blog. 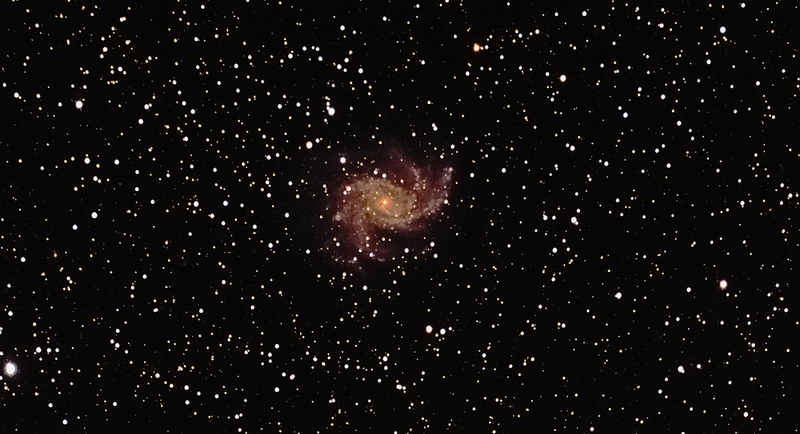 Fireworks Galaxy NGC 6946 Stacked with Maxim DL. Notice proper color rendering. I made an addition to my "Warm Room". 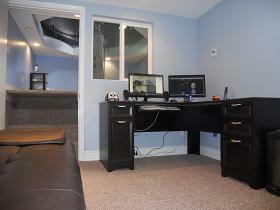 I added a 32 inch HDTV as a third monitor. This was something that I had in mind from the inception of the observatory. Its purpose aside from giving me more viewing space is to give a larger view of photos when I have people over to the observatory. Now the photos can be seen by everyone instead of hovering around a couple of computer monitors. I connected it to my computer as a monitor through a "USB to HDMI/DVI Adapter" purchased from "Best Buy". The cost of the adapter was around $40.00 and the Samsung TV was around $300.00. I connected the Adapter to a USB port and then ran an HDMI cable from the adapter to the TV. After setting up the Adapter Drivers, the system worked perfectly. A photo of Before and after is shown below. The color of the room is actually rendered like the before picture. That picture was taken with a Nikon D3 Camera. The one on the right was taken with my iPhone 7. No mater what people want to say about cell phone cameras, the D3 rendered a more precise picture. I received an Email today and was given a recommendation by Peyton Vogel to add "Home Advisor- Backyard-Astronomy" to my web site. I have looked over this site and it gives great information on the basics of astronomy. I have added this to my "Friendly Links" page found at the bottom of each page. Thanks Peyton for your suggestion. Allot has occurred in the last two months in my personal life. I have traveled to Scotland and visited that beautiful area of Great Britain. It was a great vacation and the people were extremely friendly. I would love to go back and visit again. I enjoyed the vacation so much, that I decided to retire from my day job and enjoy activities that I enjoy most, which is spending time with my wife and children along with my hobby of viewing the cosmos. On October 14, I decided to use some of my new "Free Time" by taking some pictures of some of the well known summer nebulas. 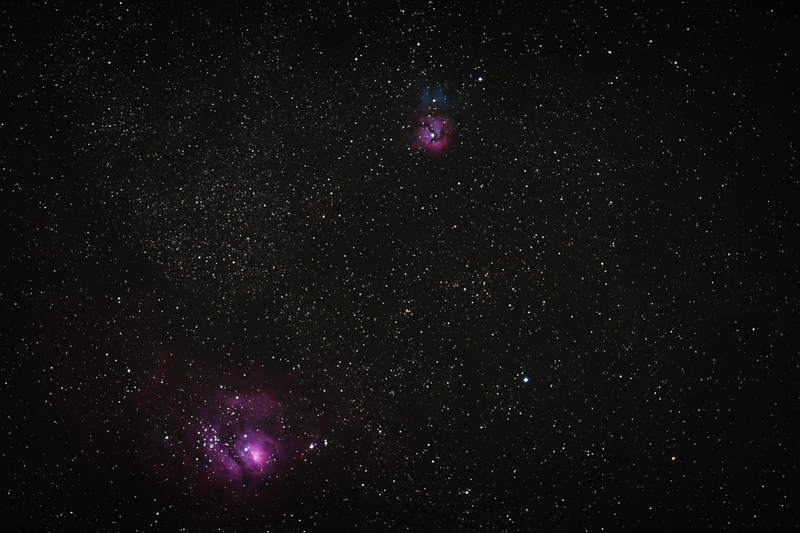 I took pictures of the Lagoon Nebula M 8 and the Trifid Nebula M 20. I'm still having problems with my stacking program DeepSky Stacker. The program stacks the images perfectly, but the color is not rendered correctly when using my Nikon D810A camera. In order to get the color rendition of the photos, I was only able to use one image with no stacking. Even without stacking, the camera produces incredible pictures. I like the above picture as it shows the relationship of the two nebulas. This was taken at full frame of the D810A camera and the HyperStar lens on my CGE 14 inch telescope. The above image was taken using the same setup, but the camera was setup in "DX" mode. This allows the camera to crop and zoom in on the image using only the camera. It amazes me that this camera can produce fairly noise free images without using image stacking. 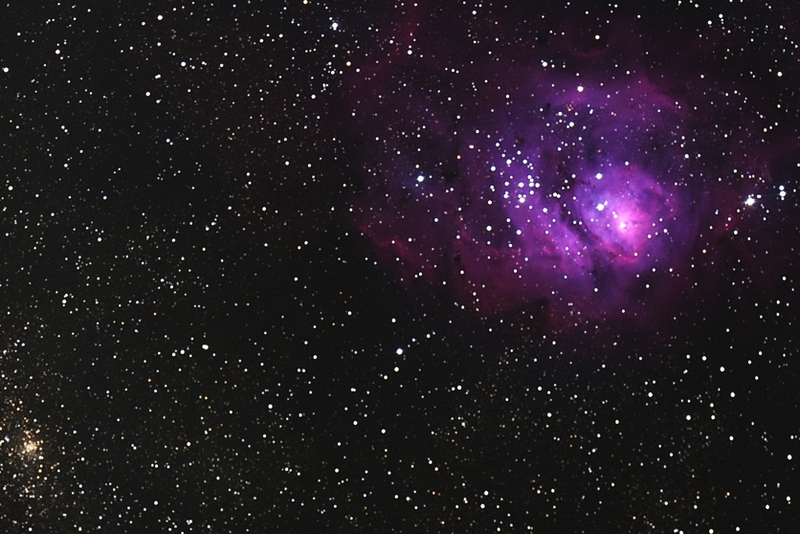 The Lagoon nebula shown above was also taken using the DX mode on the camera. The cluster in the lower left of the photo is NGC 6530. I had a fun night on August 24, taking pictures this weekend. I finely got a chance to give my Nikon D810A a work out at f/11. 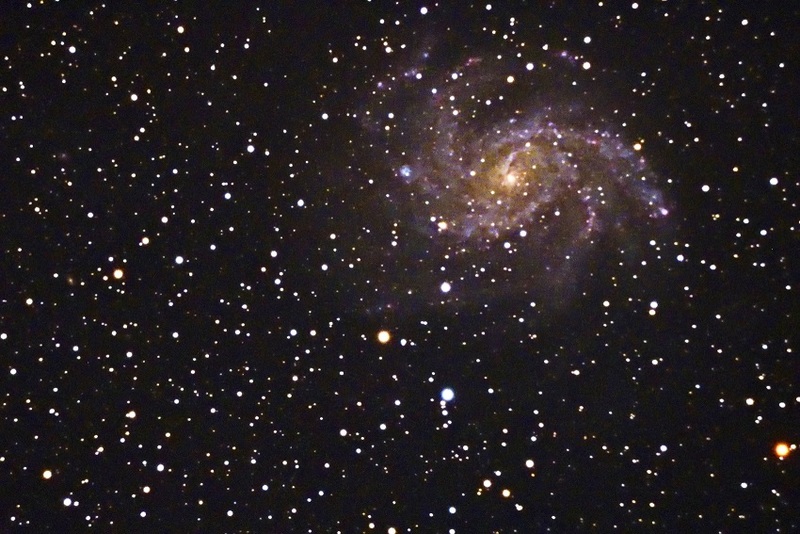 I took some pictures of NGC 6946 (Fireworks Galaxy) and M 3 Globular Cluster. I ran into some problems with stacking the Fireworks Galaxy with Deep Sky Stacker. The problem turned out to be "Not Round" stars therefore DSS had a hard time getting a reference. I did a "Polar Alignment" and found that the scope was not properly aligned. Once the alignment was complete, the stacking worked just fine with the exception of the Color rendition. For some reason the color was lacking and when I tried to bring out the color, I was only able to get a green Hue. The picture clarity was great and the stars were round but I still have not solved the color problem. I may need to try a different stacking program when I use the 810a camera. The individual pictures has great color. Only after stacking did I loose the color. 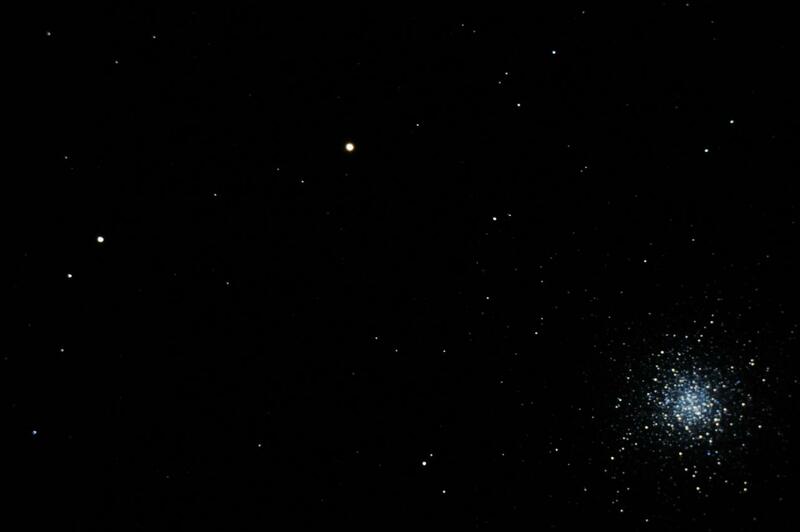 Below I have a photo of M3 a Globular Cluster. This is a single shot and due to the brightness, stacking was not necessary. Comparison of Fireworks Galaxy between 5 stacked images and 1 image. The single image is the true color. The 5 stack has a green hue but shows more detail. This has been a crazy summer for me. the last blog posting was over 4 month ago. No I haven't lost my love of astronomy, it is just the weather here has not been cooperative. Since I need to get up at 4;55 AM for my day job, I cannot stay up late at night and take pictures on the evenings I must get up for work. That leaves Thursdays, Fridays, and Saturdays to take pictures. Then there must not be a full moon and the skies must be clear. Needless to say, my window of picture taking opportunity is limited. I have not had any clear days using the criteria above to take pictures. I did have one night where I did "Scope Maintenance" by Polar Aligning my scope and doing a GO TO alignment. I have also been doing some visual star gazing. But my love of picture taking (Which Takes Time) has been nonexistent. The picture above was taken at f/11 through my 14 inch Celestron Scope. The shutter speed was 12.5 minutes at ISO 5000. I took several pictures at these settings, but for some reason, my Deep Sky Stacker program would not stack the pictures so this is a single shot. I will continue to work with the stacking program to get it to stack. Even though this is a single shot, I am pleased with the performance of the camera. Hopefully I can get more stacked pictures and a slightly sharper image. If I am able to do this I will post the image in my gallery. Tonight I was privileged to do a little "Outreach" to a local youth group from Leamington Utah. There were 17 young men and their leaders who came to the observatory do do a little stargazing. With a group that large, it was cramped in the warm room which is only 12x10 feet in area. I welcomed them and took 6 boys and their leaders one group at at time into the scope room. The others stayed in the warm room with my son Brent showing them how we take pictures and how we find our targets for a photo session. He kept them busy while I showed those in the scope room some of the better known object. It was cold outside at 18 degrees Fahrenheit, but the warm room was a comfortable 72 degrees. With a group of that size, we focused on 4 objects. The moon was not up so we looked at the following objects. All in all it was a good group session. Wow, since I haven't updated this blog since the Thanksgiving holidays, I wish everyone a delayed "Merry Christmas and Happy New Year". I have actually had fun over the Christmas and New Years holidays. My wife bought me a new "Nikon D810a camera for my observatory. Since I am a Nikon man and use DSLR cameras for my observatory, I have been coveting this camera since Nikon introduced it. The problem is, it is an expensive camera ($3700) and its primary use is for Astrophotography. I have seen several astrophotos from this camera and have read some reviews. 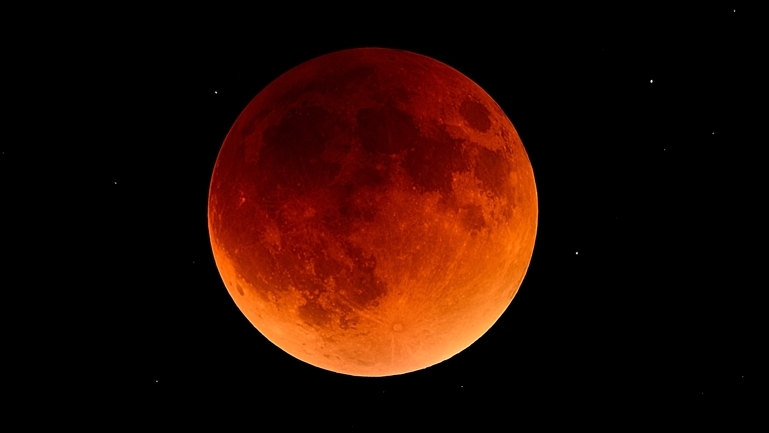 Some say it is not worth the extra cost for a camera that will give a slight "Red" tint in the pictures if used for terrestrial photography such as scenery or on People. Well that is not my primary use for the camera so that was not an argument for not purchasing it. Other reviews say that it is the best "DSLR" camera on the market for Astrophotography. I cannot objectively say it is the best DSLR for space pictures since I have not tried other cameras to make a comparison. What I can say is that it is amazing and specifically tuned to allow Hydrogen Alpha (HA) light frequencies and not filter them out like most DSLR cameras. I have a modified Nikon D5200 camera that won't filter out the HA frequencies, but it cannot hold up against the D810a. Features of the camera which are different from the "Nikon D810" (Notice no "a") include long duration exposure times natively to the camera. I can set shutter times between 4 seconds and 900 seconds (15 Minutes) without special timers connected to the camera. I can also use the "Bulb" setting for longer durations. One problem with this feature is that it resides on the camera. To use this feature you must set it from the menus "on" the camera. 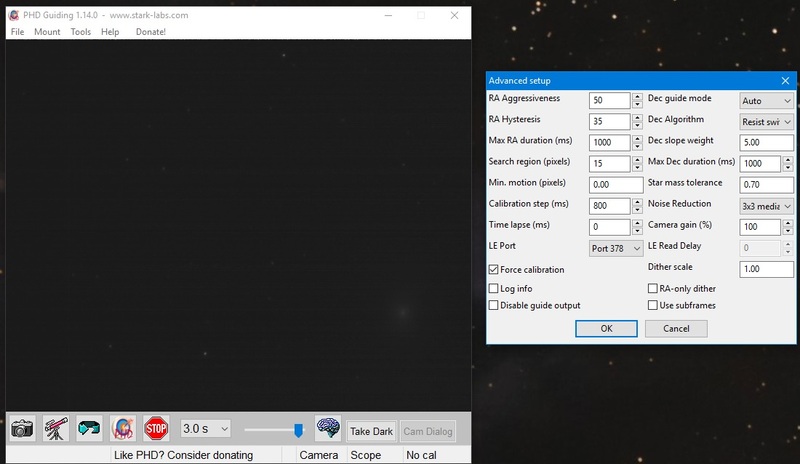 Since I use remote software and control the camera from my computer when it is connected to my scope, I cannot access this feature without actually setting it from the camera. This is not a problem for fixed cameras to a scope in an observatory connected to a computer because I do have access to the "Bulb" function, shutter speed and also ISO settings from the computer. I can also access the "Live View" and "Movie" functions when connected to the camera from a computer. An amazing feature of the camera is the ISO Sensitivity. Natively the camera can have settings between ISO 200 and ISO 12800. I can however access the ISO settings to 1 step below 200 which gives me the capability of shooting at ISO 100. I can also access settings to 2 steps above ISO 12800 which gives me a whapping 51,200 ISO!! Granted, at that setting there is allot of noise. But it does help with "Framing" the galaxy or nebula without needing long exposures to do so. Once the object is framed, the ISO is reduced and time extended to get the picture I want. Below are two pictures I took of the Horsehead Nebula through my scope at f/11. One at 3200 ISO with a shutter of 8 Minutes, and one at 12800 ISO with a shutter of 3 minutes. These are single shots with very little post processing. The photo on the right is slightly more "grainy" or has more noise than the one on the left. However, the shutter time is less than half of that on the right. The noise can be taken care of with using "Stacking". It amazes me that the ISO 12800 photo is as clean as it is for only a single shot and no stacking. I have not posted these in my gallery as I want a "Landscape" picture at lower ISO values and do some stacking with my "Deep Sky Stacker" program. They are shown here only for illustration of the low noise capability of the camera. I think I can get a wonderful picture of this Deep Sky Object (DSO) with my new D810a Camera. For me it was worth the extra cost. However, it is still less than "Dedicated Astrophotography" cameras and I can still take a picture of my family if I choose to do so. It has been a month since I last updated this blog, but I haven't been slacking. I have been having problems with my internet connection to the Observatory and had to change providers. Duuring that time, I fixed (Hopefully) a roof leak between my warm room and the scope room. I used alot of roof seal tar and some foam so that I could get a good slope to the gutters. I hope this solves the problem. It rained all last week and no sign of leak. 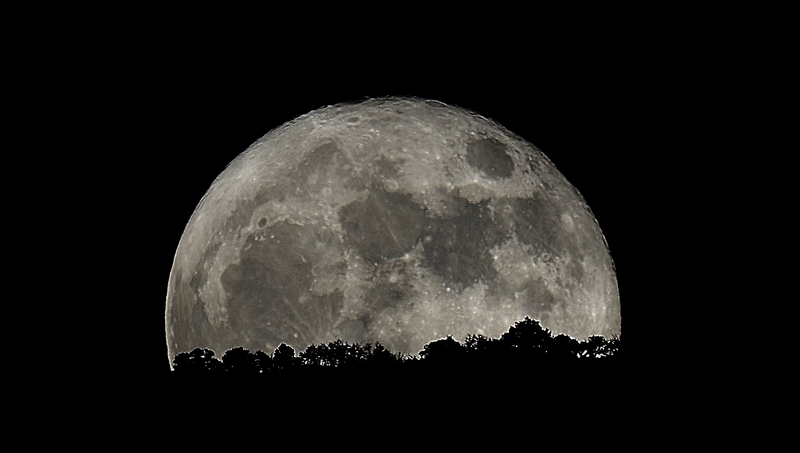 I also took a picture of the "Super Moon" on November 14. I took it just as the moon was rising over the eastern mountains of Oak City. I really like how it turned out. 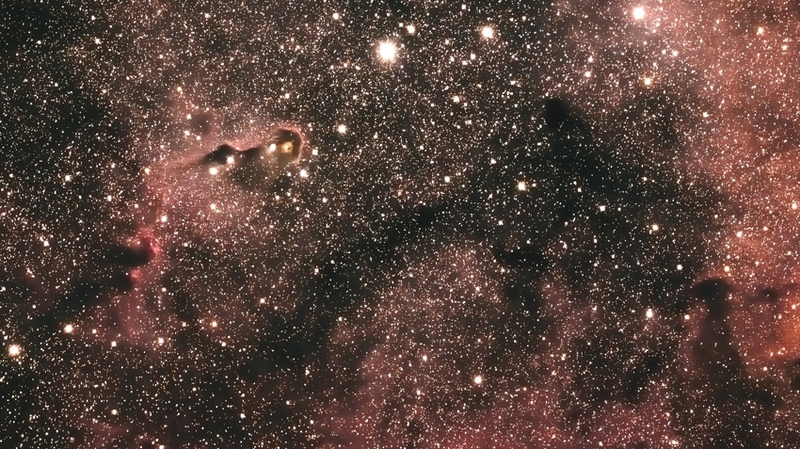 Earlier this month, I took a picture of the Elephant Trunk Nebula (IC 1396) located in the constellation Cepheus. I used my HyperStar lens to get the wide view of the nebula. Most photos only show the trunk which is actually IC 1396A. The trunk in my picture is in the 1st quadrant. The entire picture shows the massive size of the nebula. Since the nebula is in the dense cross section of our Milky Way Galaxy, you can also see the million of stars in the fore and background of the picture. Below is a picture of the nebula. On a different subject, I have been working on the roof of my Observatory. Earlier this spring I noticed that a water leak had formed in the Scope Room on the common wall between the Scope Room and the Warm Room. This caused the paint to bubble and sheetrock to break. I will eventually post my repair job in the Observatory section of this web page. I had flashing between the two rooms, but the water leaked on the Scope Room side. There was no water that reached any of the equipment in the Scope Room. Last week, Tom Beck and his wife Barb came to visit the Dry Creek View Observatory. Tom is interested in building his own observatory and wanted to see how I took pictures and how my observatory is set up. I had a good visit and hopefully answered his questions. Tonight, I borrowed my Son's Nikon D800 camera to see how the sensor in that camera performs. I am looking at purchasing the D810A which is tuned specifically for Astrophotography. The sensors in each camera are essentially the same, but the D810A has a "Tuned" IR filter to allow for a wider spectrum of light to be captured. I was impressed with the D800. 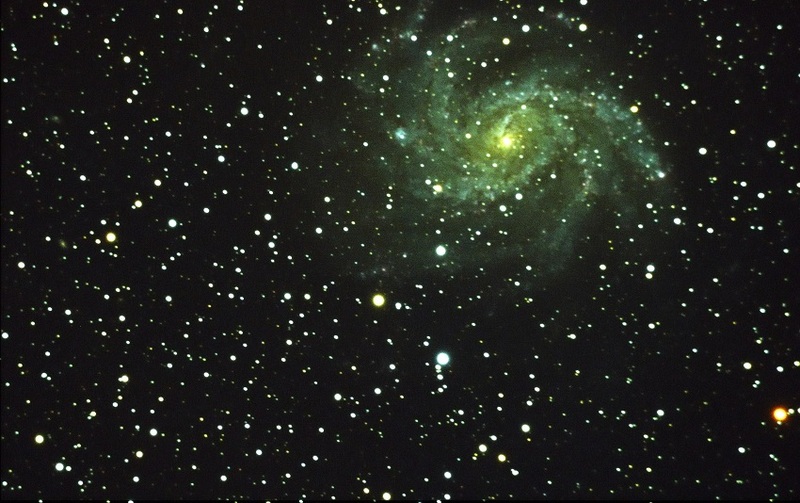 A picture of the "Firework" Galaxy (NGC 6946) is shown below. I like how the veins in the galaxy are visible in this picture. 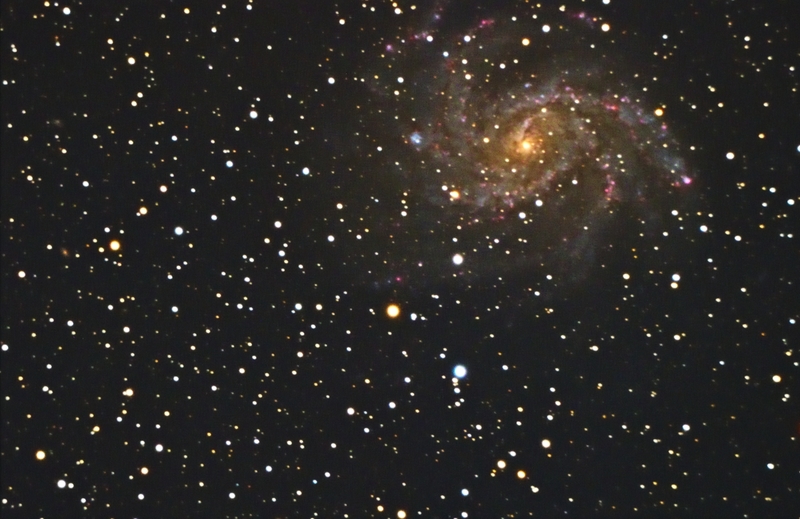 A larger picture of this galaxy is shown in the Astrophotography Gallery. On August 6, 2016, the sky was clear and the Moon was just starting to show itself in the Western Sky. I decided to do some close up photography. 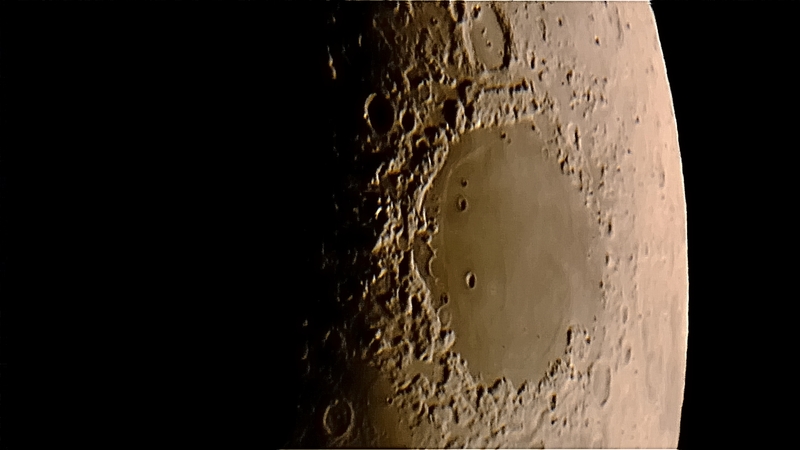 The image is of Mare Crisium. The magnification was about 312 X. I got this magnification using my 4X Tele Vue Powermate. Still shots from my camera were blurry due to the atmospheric distortion. I took a "Movie" with my camera at 1920x1080 for about 40 seconds. I then processed the image using RegiStax 6 and Nikon Capture NX2. I think the detail turned out well considering the moon was low in the Western Sky at the time the picture was taken. A larger image can be viewed from my gallery under "Solar System"
I had a better night tonight. 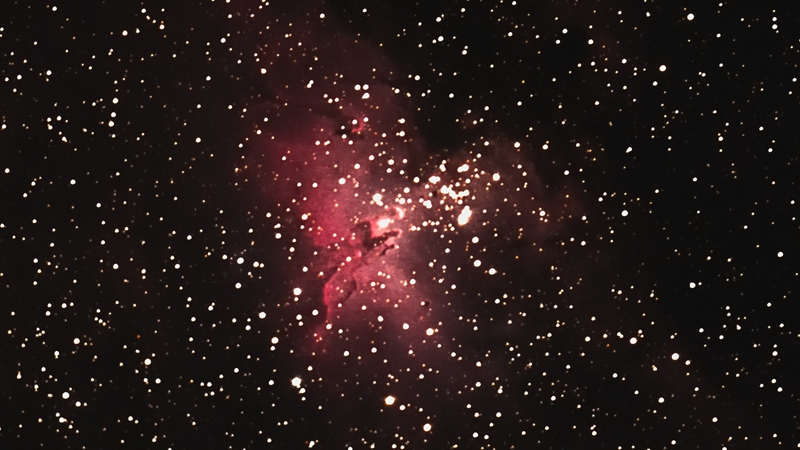 Around midnight the wind died down and I took more shots of M 16 the Eagle Nebula. I was able to get good tracking and took 31 light frames at ISO 400 for a duration of 1 minute. I reposted the image in the gallery and replaced the image here in the Blog below July 8, 2016. It is a much better image with more detail. July 9, 2016, 31 light frames stacked. I have been obsessed lately with Planetary Photography. So, I loaded my Jupiter AVI into RegiStax 6. For once I had a clear calm night and was able to get good focus and to load a "Fair" quality movie. On another try, I was able to get the "Great Red Spot" but the seeing conditions were lousy. 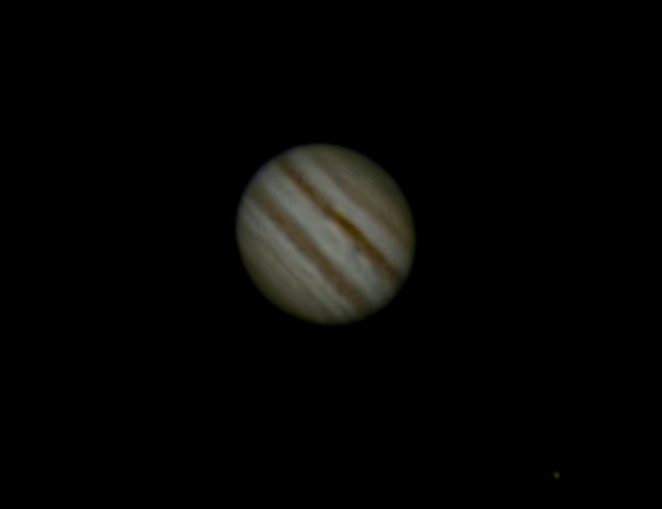 This time however, no Red Spot, but I managed to get Europa in the picture. The results are shown below. Europa is in the bottom right corner of the photograph. I have posted a larger version in my gallery. I would like to make a shout out to those living in Massachusetts, New Hampshire, Maine, and the great country of Canada. Over the last three weeks, I have been on a vacation to this area. We started in Boston and went as far north as Prince Edward Island. I must say that those of you who live in these areas, you were really friendly, and the scenery was gorgeous. I can’t leave out the food, it was delicious. I gained 3 pounds on that trip. Even though the weather was cool, it was mostly cloudy therefore I couldn't see any stars or planets. When I got home, I took this picture of Saturn. Still not very crisp, but I am getting better. I posted it here so that I can see if I am making any progress with Planetary Photography. I used a 4X Tele Vue Power Mate and my Nikon D5200 in video mode. I took a 60 second video at 1280 X 720 and 60 frames per second. I used Registax 6 for stacking. Even though I have a large Aperture Scope at 14 inches, I may have too much magnification to get a sharp focused picture. I am going to try again with a 2X Barlow and see if I can get it much more crisp. 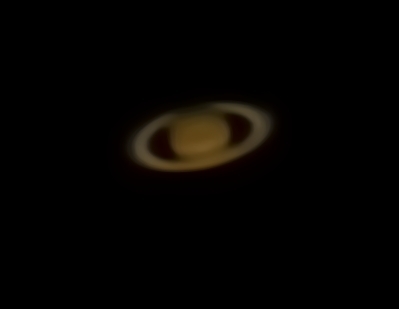 If any of you have suggestions on planetary imaging, and would like to give me some tips, drop me an email. My contact information is listed under the "contact us" tab. Finally a great night for picture taking. The moon was rising early in the morning and I had set my sights on taking a picture of Comet 252P/LINEAR. The challenge was getting the shot before moon rise over the eastern mountain. I finally got the shot shown below at around 5:00 am on April 2. 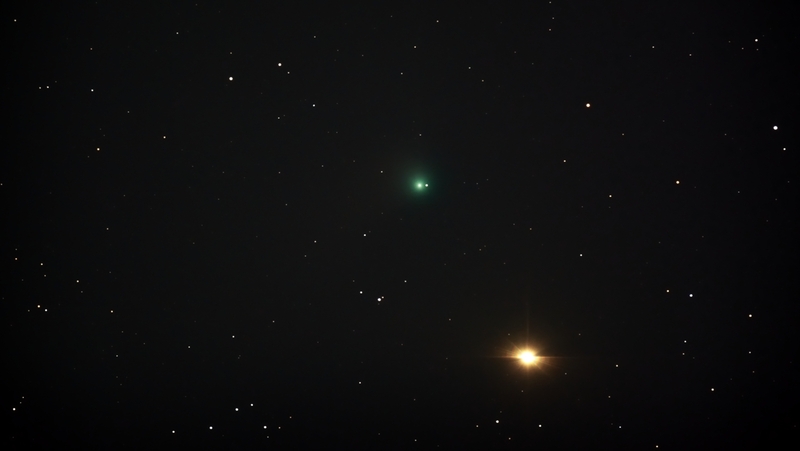 No traditional tail on this comet as it just shows up as a green ball. A larger picture can be seen in the gallery along with details on what camera and equipment were used. I promised a review of my new StarShoot Autoguider Pro in comparison with my older version StarShoot Autoguider. 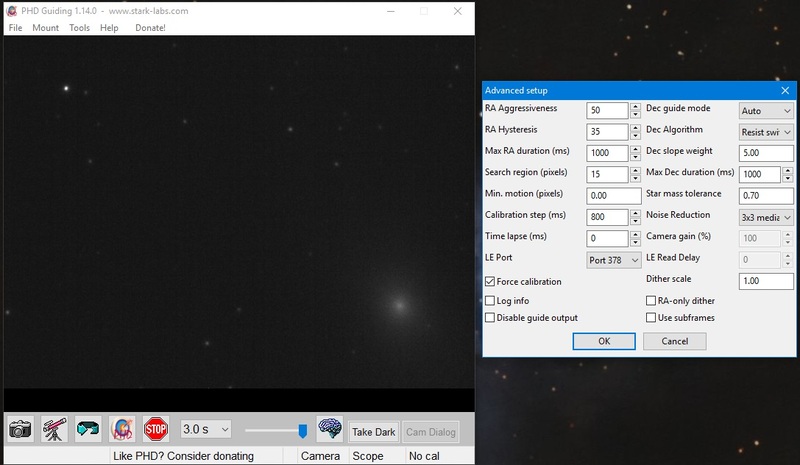 Last night, the skies cleared enough for me to get a lock on the Andromeda Galaxy I pointed the scope to Andromeda and opened my original Starshoot Autoguider in PHD Version 1.14. I set the camera Gain to 100 and looped the exposures in 3 second intervals. This is not a technical review giving the pixel resolution or the "Quantum Efficiency" of each camera, only a visual picture of what each camera sees given all other parameters are equal. Both cameras were attached to a Celestron 80 mm refractor guide scope. Above is the Autoguider image with "Brain Settings" shown on the right. Above is the Autoguider Pro image with "Brain Settings" shown on the right. As you can see from both Images above, the Autoguider Pro renders more stars and a more detailed image of Andromeda. For my purposes, I will only use the Autoguider Pro for finding a suitable guide star and then guiding my mount. I feel that changing to the Autoguider Pro was worth the extra dollars spent as more stars are rendered as suitable guide stars. The best test would have been on the Whirlpool Galaxy M 51 as suitable guide stars are hard to find with my setup on M 51. But this galaxy was too low on the horizon to be used for this comparison. 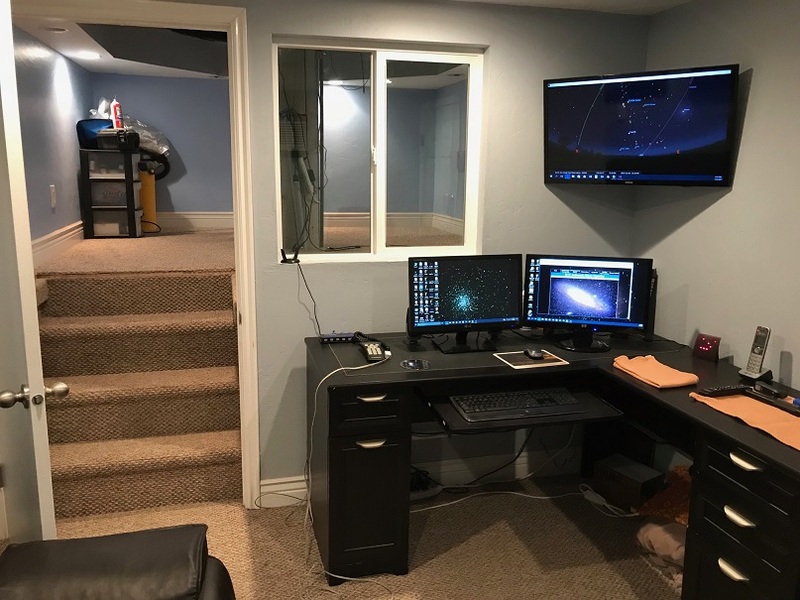 Due to suggestions from those who visit my web page, I have made some major adjustments to the "Astronomical Viewing Blog" which you are now viewing. I have made an Archive folder indexed by year so you can see my older posts. This page will now be dedicated to the current year we are now in. To go to the "Astronomical Viewing Blog Archive" page, simply click on the link "Astronomical Viewing Blog Archive" above then select the year you want to view. I made these modifications to the web page, because my skies have been horrible during the past "Month" and viewing or imaging has been impossible. It was pointed out that my tutorial on "All-Star Polar Alignment Procedure" had some errors in it. I have corrected the errors and reposted it under the "Setup Tutorials" tab. The error had to do with saying to use the "Up and Down" arrows when making the final approach centering on a star. The correct wording should be "Up and Right" arrows. I have been having problems lately with my StarShoot Autoguider Camera. It was an older version, and has served me well. The problem with the camera started manifesting itself last summer when I was tracking a Deep Sky Object. I would intermittently get an alarm from my PHD software saying that it had lost lock. I would look at the computer and could see that half of the image was dark and showing no stars. Then as the camera would take other images the picture would return to normal and the lock would be regained. Because of this problem, I purchased and received today the StarShoot Autoguider Pro. This camera is much smaller and much more sensitive. I am planning on putting a comparison of the two on this page when I get some clear skies and can focus on the same object. I have placed a picture of the camera under the equipment tab. Happy New Year! I hope you all have “Clear Dark Skies” when the observing desire strikes. On New Year’s Day, at 3:30 AM I set an alarm so I could take a picture of “C/2013 US10 (Catalina)”. That would be Comet Catalina. 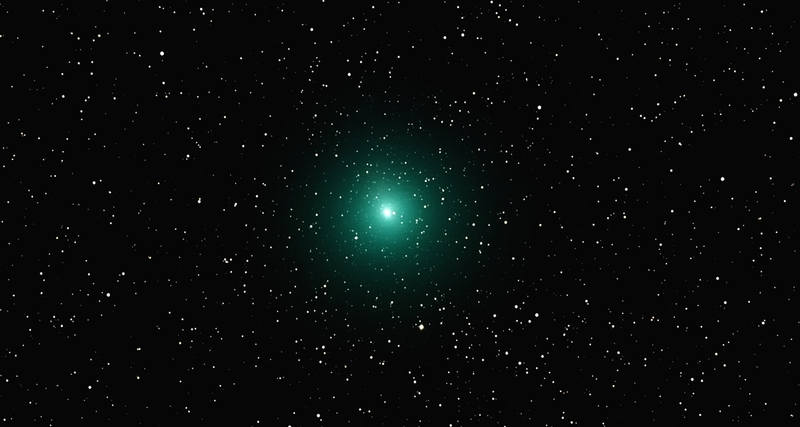 The comet is about a 4.4 magnitude and is presently near the star Arcturus. I took the photograph, but I couldn't get an image of the tail due to the sky being washed out by the moon. Every time I tried to take longer exposures, the photograph was washed out. I need a dark clear night and I will try again. I have posted the picture I took below but have not posted it in my image gallery. I am waiting for better conditions. The bright star in the photograph is Arcturus.